On Anzac Day last Friday JJ and I went to visit friends up in the Adelaide Hills and I took my camera. Normally when we head up that way we drive up the Freeway because it’s quicker and there’s two lanes in case someone is going slow you can overtake them. At Aldgate we veered off the freeway and I decided to take non-freeway route. This was dangerous for me because I had no idea which way to go as I’ve never done it before. The reason I wanted to do it was because it does get monotonous going the same way all the time and I wasn’t in a huge hurry. The reason I decided to go a new way was because I love autumn colours and wanted to have a look at the scenery on the way (as much as I could being the driver and all). JJ snapped some pictures in the back seat of the car and they all turned out pretty blurry but on the outskirts of one town we stopped and I took a couple of photos. For those non Australian readers I’ll explain a couple of things about this photo. We drive on the left side of the road here (you can see the little blue car on the left side of the road in the distance). When I nannied in England I remember my employer reiterating a few times that they drove on the left side of the road. I explained to her that Australians do also and she hadn’t known that. The two signs on either side of the road tell motorists that when the lights are flashing (the lights are further down the road again) that they need to slow down to 25 kilometres per hour. These signs are typically out the front of a school, childcare centre or kindergarten and it appears as though this mystery town has a school on the left of this photo. The last thing I’ll explain about this photo is that it was taken on 25 April and it’s autumn here. We call fall, autumn – don’t ask me why the same season is called different things in different parts of the world. As it turned out it would have taken the same amount of time to go this back way as it did the supposedly quicker freeway route. Now I know which way to go I’ll be able to pick and choose. 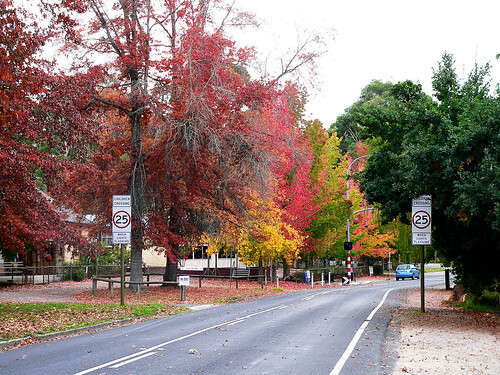 Aren’t the colours in the trees simply gorgeous? We have some in our street all turning at the moment – looks lovely. Yes, they are gorgeous. Autumn is my favourite time of year for colour eclipsing spring. I like spring for the smells. Truly beautiful shots – and I love how the back way can often be shorter and therefore justifiable! Thanks for the explanation..gorgeous photo’s….I love Autumn!! Stacie, I had you in mind when writing the latter part of this post. There will be more.